No worries about drinking egg nog that contains raw egg with this recipe! 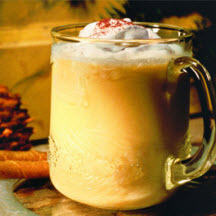 Think of egg nog as liquid custard served in a cup. Instead of the traditional sprinkling of nutmeg on top, try one or two of the suggested garnishes and stir-ins. In large saucepan, beat together eggs, sugar and salt, if desired. Stir in 2 cups of the milk. Cook over low heat, stirring constantly, until mixture is thick enough to coat a metal spoon with a thin film and reaches at least 160°F (70°C). Remove from heat. Stir in remaining 2 cups milk and vanilla. Cover and refrigerate until thoroughly chilled, several hours or overnight. Just before serving, pour into bowl or pitcher. Garnish or add stir-ins, if desired. Serve immediately. Makes 1 1/2 quarts or 12 (1/2-cup) servings. *For faster preparation heat milk until very warm before stirring milk into eggs and sugar. Microwave Method: In 2-quart liquid measure or bowl, beat together eggs, sugar and salt, if desired, until thoroughly blended. Set aside. In l -quart liquid measure or bowl, cook 2 cups of the milk on full power until bubbles form at edges, about 5 to 6 minutes. Stir into egg mixture. Cook on 50% power until mixture is thick enough to coat a metal spoon with a thin film and reaches at least 160°F, about 5 to 6 minutes. Stir in remaining 2 cups milk and vanilla. Continue as above.